The Bernier and Dorre Island Lock Hospitals is a shocking part of WA’s history. Between 1908 and 1919, several hundred Aboriginal people from across WA were forcibly removed from their family and country to these lock hospitals via Carnarvon. Many of those family members who were separated during the lock hospital scheme never saw each other again. It’s conservatively estimated that more than 200 people died on the islands. On Wednesday, 9 January 2019, a Centennial Ceremony will be held at Carnarvon’s One Mile Jetty Café at 3pm. The ceremony will remember and recognise the story, and history of the Bernier and Dorre Island Lock Hospital tragedy. The State Government and the Shire of Carnarvon have provided funding for a bronze sculpture to acknowledge the centennial anniversary of the last person to be repatriated from the Lock Hospitals, off the coast of Carnarvon. The sculpture will be unveiled at a separate event in 2019. For more information about the Lock Hospital tragedy click here or to download a PDF about the Lock Hospital tragedy click here. Nanda native title determination photo gallery live! At an on-Country Federal Court hearing on 28 November 2018 at Kalbarri Foreshore in WA – the Nanda people were formally recognised by the Federal Court as native title holders, after a 24-year long legal process. About 300 people attended the hearing. The State Government is calling for Expressions of Interest for funding under the second round of the $20 million Aboriginal Ranger Program. 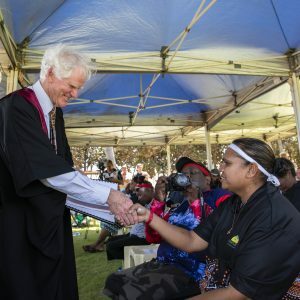 The first round of the program provided $8.45 million to 13 groups across the State, creating 85 new jobs and 80 training opportunities for Aboriginal people, including 47 female Aboriginal ranger positions. YMAC was successful in securing funding in the first round on behalf of Malgana Shark Bay People’s Native Title Claim Group, as part of the proposed “Pathway to a Malgana Country Land and Sea Management Program”. Round two will see rangers employed to undertake land and sea management including conservation, cultural, tourism and education activities across a range of tenures. A total of $9 million will be available in the second round, for single or multi-year projects up to three years. The Kariyarra people yesterday celebrated the recognition of their determination of native title by the Federal Court. About 140 people attended the on-Country Court hearing at the Civic Gardens in Port Hedland. It has been a 20 year-long journey for the Kariyarra people to achieving native title recognition.